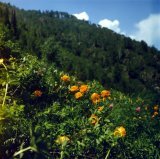 A wide range of ornamental plants is found in the Siberian mountains, Altay and Sayan; these regions comprise a special Floristic Province within the Circumboreal Floristic Region (Takhtajan, 1986). 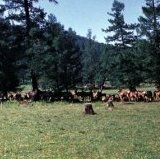 Altay is surrounded by steppes and by a transitional type of vegetation or forest-steppes; its southern foothills are bordered by semideserts, the northern deserts of Dzungaria as well as the mountain steppes of Kazakstan and Mongolia. Only in the northeastern Altay are these mountains adjacent to the great coniferous forests of Siberia. 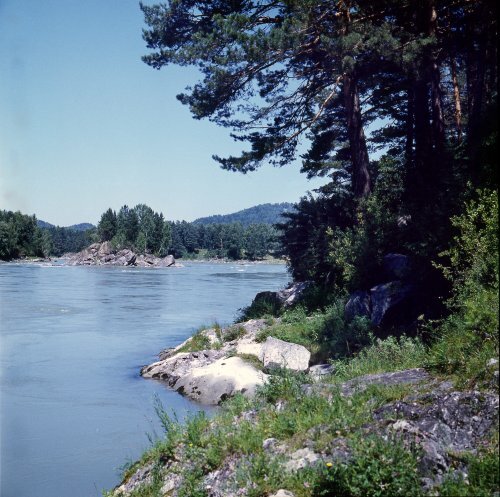 The southwestern Altay is geologically related to Tuva and Mongolia. The middle and lower parts of the Bukhtarma valley were colonized in the 18th century by runaway Russian peasants who established it as a free republic. Between 1896 and 1909 years over a million immigrants settled in the Altay region and the population surged again during World War II. The Altaian flora (including Russia, Kazakstan, Mongolia and China) contains about 2800 species of vascular plants (Kamelin, 1998). Nearly half of the species are Asiatic plants, and 40% of them are Holarctic and Eurasian. 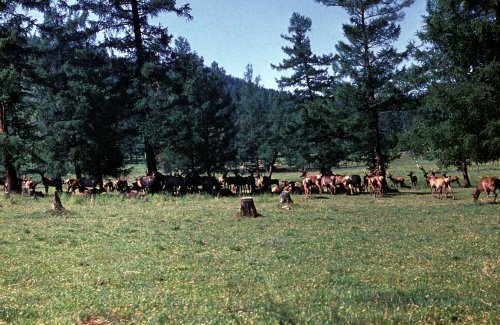 Species of a smaller distribution area, occuring in Altay, are mainly common to either the Sayan or Mongolia. 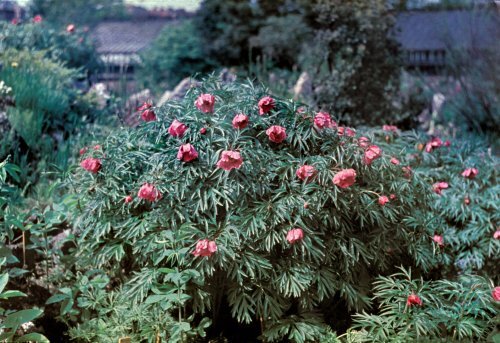 About 150 Altaian species of trees, shrubs, and herbs were recommended for cultivation in gardens and parks. In the past few decades, this number has increased to 200 species of herbs and 40 of ornamental shrubs. Of the few Altaian species commonly known, most have been taken into cultivation from areas other than the Altay. For example, a daylily (Hemerocallis minor), which has been widely cultivated in China for many centuries, was introduced into world horticulture from China, but not from the Altay where it is native and represented by a range of interesting forms. The fritillary (Fritillaria meleagris) has been grown in European gardens since the sixteenth century and martagon lily or Turk's cap lily (Lilium martagon) has been cultivated in the Mediterranean since the earliest historical times, but both species were introduced from European populations. However, Altaian populations represent genetic diversity and can enrich the germoplasm of hybrids already in cultivation. Some Altaian species although found in a few garden catalogues are very rarely grown. Among them are a blue large-flowered columbine Aquilegia glandulosa, a lady's slipper red orchid Cypripedium macranthon as well as a large-flowered violet Viola altaica. Centaurea, fleabane Erigeron, alfredia Alfredia, Chrysanthemum [=Dendranthema], Heteropappus, Leucanthemum, Pyrethrum and Tanacetum. The lily family (Liliaceae s. lat.) includes showy species of trout lily Erythronium, fritillary Fritillaria, day lily Hemerocallis and lily Lilium. Most of the ornamental shrubs of the rose family (Rosaceae) are found in the genera hawthorn Crataegus, shrubby potentilla Pentaphylloides and Rosa. Most of these ornamental species grow in subalpine and alpine areas. They belong to different life forms within a perennial habit, and are predominantly decidous. The Altay mountains represent the northern boundary for many plant genera and species distributed in Central Asia and other regions to the south (e.g., genus Eremurus, species Dictamnus angustifolius). Some plant taxa show ancient relationships to tropical areas of other continents. The composite genus Leibnizia is closely related to Gerbera, which occurs in South and East Africas and tropical Asia. 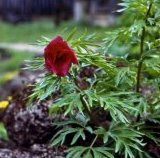 The Altaian Leibnizia anandria grows in dry oak forests and does well even in the cold climate of St. Petersburg. but lovely silver birch Betula pendula. Smaller trees and shrubs such as mountain ash Sorbus sibirica and alder [Duschekia fruticosa =Alnus fruticosa] form the undergrowth of tall-canopy forests. On the lower slopes of mountains, herbs and grasses reach an impressive 2 m (6.5 ft) in height. Such grasslands and meadows are dominated by angelica Angelica sylvestris, hogweed Heracleum dissectum, alfredia Alfredia cernua, bugbane Cimicifuga foetida and larkspur Delphinium elatum. From early spring to late autumn, flowering plants spectacularly brighten the lower margins and glades. In spring, even near melting snow, one can see the yellow-flowered Corydalis bracteata, which is one of the earliest to flower, a yellow primrose Primula macrocalyx, a blue forget-me-not Myosotis sylvatica as well as the pink trout lily Erythronium sibiricum, a very attractive plant. 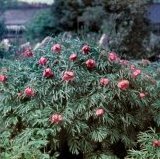 In late spring, Paeonia anomala, an extremely attractive herbaceous paeony with numerous large pink flowers, and the large-flowered slipper orchids Cypripedium calceolus, C. guttatum and C. macranthon can also be found locally. These lower mountain slopes are home to popular garden plants such as Turk’s cap, or in the Russian language, Tsar's curls or Lilium martagon, and a light blue ladybell Adenophora liliifolia blending with a dark blue colombine Aquilegia sibirica. Southern prairie-steppe slopes house monkshood Aconitum anthora, delphinium or larkspur Delphinium laxiflorum, daylily Hemerocallis lilio-asphodelus and primrose Primula cortusiodes. These stony slopes are also inhabited by ornamental shrubs such as Berberis sibirica, Cotoneaster melanocarpus, Lonicera tatarica and Sibiraea laevigata. Rhododendron ledebourii is a hardy shrub that can be grown successfully in cold regions; it is closely related to R. dauricum from which it differs in its evergreen leaves and deep pink-violet flowers. Completely unknown to horticulture is the Altay endemic sibirea Sibiraea laevigata, a very attractive shrub with entire leaves, which is closely related to spirea Spiraea. It usually occurs on slopes mixed with other shrubs such as tatarian honeysuckle Lonicera tatarica with flowers of different color from pale pink to scarlet red. In early spring, flowering perennials make a colourful display on the stony southern slopes. Most of the early spring plants have yellow flowers (e.g., Adonis villosa, Corydalis nobilis and Tulipa altaica). They are especially attractive when interspersed among the light lilac tulip Tulipa patens, blue forget-me-not Myosotis asiatica, pink trout lily Erythronium sibiricum and the bluish-violet pasque flower Pulsatilla patens. 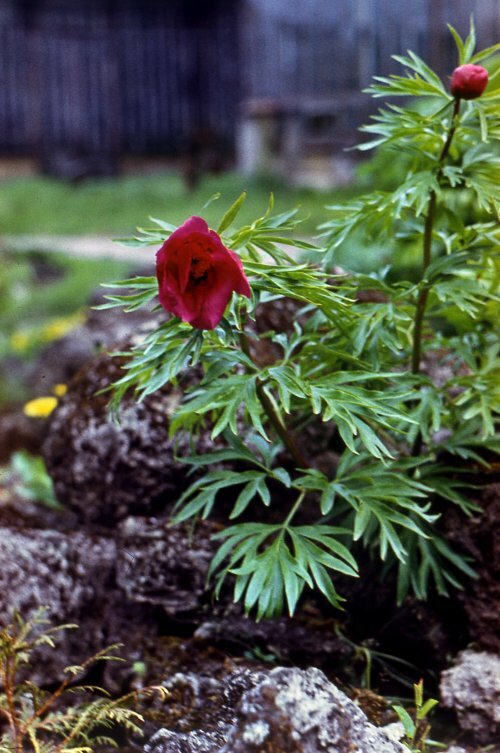 In summer, the bright red paeony P. intermedia, a pink-flowered P. hybrida, and another red-flowered paeony P. anomala, the dark blue larkspur Delphinium laxiflorum and the bright red Maltese Cross Lychnis chalcedonica make a magnificent display. Also showy the lilac-flowered iris Iris ruthenica and the yellow stonecrop Sedum hybridum both grow on low, sunny, rocky slopes, are quite beautiful. The 77 km (47.8 mi) long Lake Teletz lies in a narrow valley. 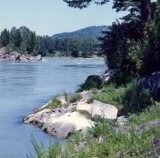 The Biya River has its source in the lake and later joins the Katun River creating one of the largest Siberian river Ob’. The southern part of Lake Telez is bordered by rugged mountains. Although the cliffs along the lake shore are scenic, they are unsuitable for plant hunting expeditions; however, excursions along the northern shores can be rewarding during the long summers here. herbs. Often on the steeper northern slopes, one can see a wonderful display of herbaceous cover including iris Iris bloudowii with its yellow flowers, orange-flowered primrose Primula cortusoides and another iris Iris ruthenica, whose dark blue flowers are subtle hidden among its grass-like foliage. The beautiful perennials Trollius asiaticus, Erythronium sibiricum, Paeonia anomala and Aquilegia sibirica as well as the liana Atragene sibirica [=Clematis alpina subsp. sibirica] are the most familiar, but they are uncommon in forests adjacent to semideserts in the central Altay. The stony semi-deserts in that region are inhabited by tough perennials such as grasses Stipa capillata, Festuca pseudoovina, and also cinquefoil Potentilla acaulis and species of Artemisia. The southern slopes are mostly shrub-covered, with Caragana pygmaea, C. arborescens, Cotoneaster melanocarpus, Lonicera microphylla and Spiraea hypericifolia. The alpine steppes are characterized by particularly noteworthy ornamentals. Some well-known garden subjects can be found growing in the wild. Among them is the alpine aster Aster alpinus, which in this region develops light violet inflorescences larger than elsewhere in its range. The widely appreciated edelweiss is represented by another edelweiss species, Leontopodium conglobatum, L. fedtschenkoanum, L. ochroleuca. Unlike Leontopodium alpinum, which usually grows as solitary plants, these species are caespitose plants and form large impressive tufts. They differ also in their leaves, which are yellowish-grey tomentose. There are different forms, some of them less impressive than L. alpinum, but others very attractive, with larger "edelweiss stars". Fortunately, these species are easy to cultivate. Pink-lilac Goniolimon speciosum, a genus related to limonium; and yellow Patrinia intermedia are also very attractive, with numerous flowers. Many of these ornamental species are quite widespread in the alpine meadows, primarily in central and northern Altay. 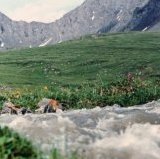 The subalpine forests are replaced at 1800 to 2000 m (5,900-6,500 ft) by subalpine meadows. Abundant in herbs, these include Aconitum septentrionale, Aquilegia glandulosa, Phleum alpinum, Saussurea pricei, Thalictrum minus and Veratrum lobelianum, and some are also common to alpine meadows. Low shrubs and dwarf trees also dot the low meadow landscape. Among them are Pentaphylloides fruticosa [=Dasiphora fruticosa], Betula rotundifolia and Salix glauca, with dwarf Juniperus shrubs in some places. The grassy alpine meadows are clothed with graminoid Trisetum altaicum, Anthoxanthum odoratum and the sedges Carex atrata and C. tristis. Alpine ornamentals include Anemonastrum crinitum, Aquilegia glandulosa, Callianthemum angustifolium, Dracocephalum grandiflorum, Gentiana decumbens, Geranium albiflorum, Papaver nudicaule and Viola altaica. Along the snowline and water-courses, one can see columbine Aquilegia glandulosa, pansy Viola altaica, primrose Primula nivalis and globeflower Trollius altaicus. 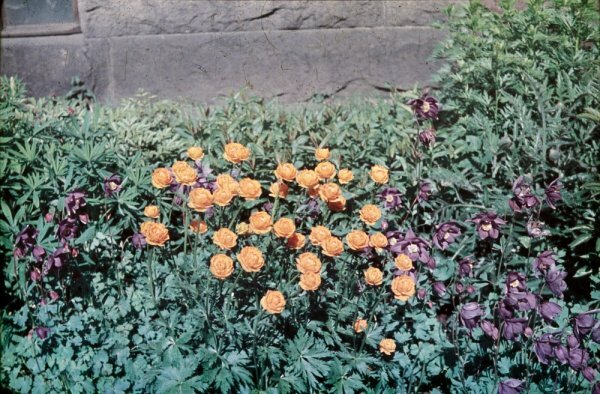 This last plant, has orange flowers with a dark purple centre pleasantly contrasting with other Trollius species. A pale lilac globeflower Hegemone lilacina, mentioned among the most interesting plants of the Central Asia, also grows here. Many primroses such as the pink-flowered Primula nutans, the purple-flowered P. longiscapa and the pink-violet P. nivalis, along with the closely related pink-violet cortusa Cortusa altaica, are common. Forget-me-not Eritrichium altaicum and E. villosum should intrigue gardeners because both are attractive cushion plants with blue flowers. The rare and very beautiful Paraquilegia anemonoides grows on rocky slopes in the alpine belt. It has taproots that penetrate deep into stone crevices, leaves that form striking rosettes, and stems, which are twice as long as the leaves, that bear large, pale lilac flowers. Pasque flower, Pulsatilla campanella, which has bluish-violet and narrow, bell-shaped flowers, can be seen in rocky places. The family Crassulaceae is represented by a compact dwarf shrublet Hylotelephium populifolium [=Sedum populifolium], which typically inhabits the rocky slopes above rivers near Lake Telez. Owing to its unusual life form and ease of cultivation, this species is widely appreciated by botanists and gardeners, respectively. Other Crassulaceae desirable for gardens includerodiola Rhodiola rosea, widely distributed, and some local species of the same genus such as R. algida, R. gelida, R. krylovii and R. quadrifida. Siberian tea Bergenia crassifolia, a popular garden plant in the United States, is a plentiful rock inhabitant here. Pseudosedum lievenii, Rosularia alpestris and Sedum albertii are also beautiful plants suitable for the rock garden. 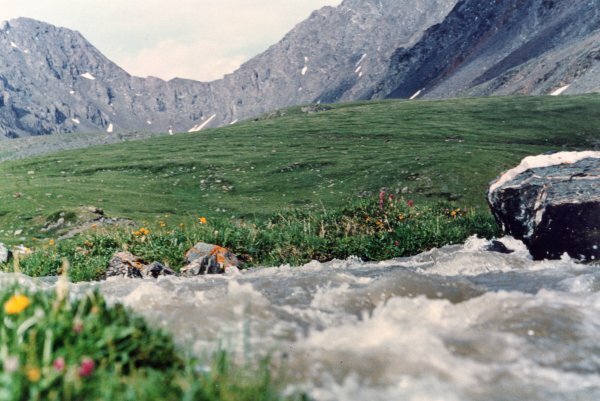 The southern part of Altay which is called the Kazak Altay includes the Southern (Yuznyi) Altaian Range. It is home to many resplendent plants, some of them are endemic, e.g., a dwarf Russian almond Amygdalis ledebouriana [=Prunus tenella], Daphne altaica and Pyrethrum kelleri [=Chrysanthemum kelleri]. The last species, Pyrethrum is very rare in nature, but certainly a potentially wonderful garden plant because it has large, 5 cm across inflorescences of white flowers and ornamental leaf rosette. 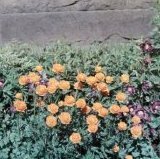 There are other species of the same family Asteraceae in the Altay region that are of horticultural value: Chrysanthemum sinuatum [=Dendranthema sinuatum], Pyrethrum [=Tanacetum] krylovianum, Pyrethrum [=Tanacetum] pulchrum all would be staple bloomers in a garden setting.